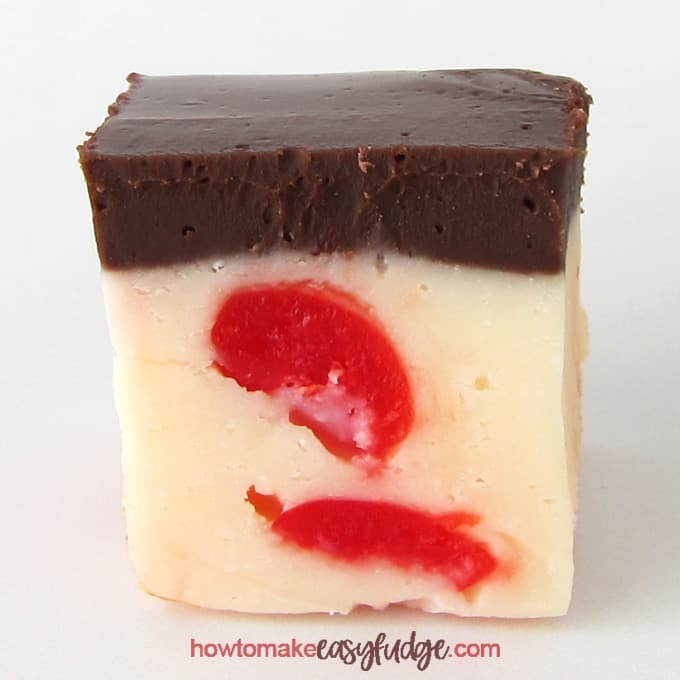 Enjoy creamy cherry fudge topped with a layer of cola flavored chocolate fudge. 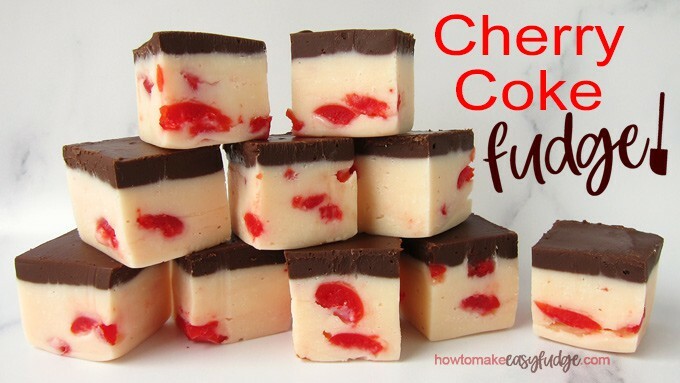 This two layer Cherry Coke Fudge looks as great as it tastes and is so easy to make. Do you love Cherry Coke? Then you have got to try this Cherry Coke Fudge. 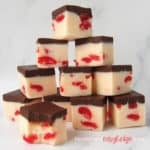 It is made with a layer of creamy white chocolate fudge that is flavored using a splash of maraschino cherry juice and a few drops of cherry flavoring and is filled with pieces of juicy maraschino cherries and topped with a thin layer of cola flavored chocolate fudge. When you take a bite, the flavor of cherry and cola blend together seamlessly creating a unique cherry cola flavored Fudge. 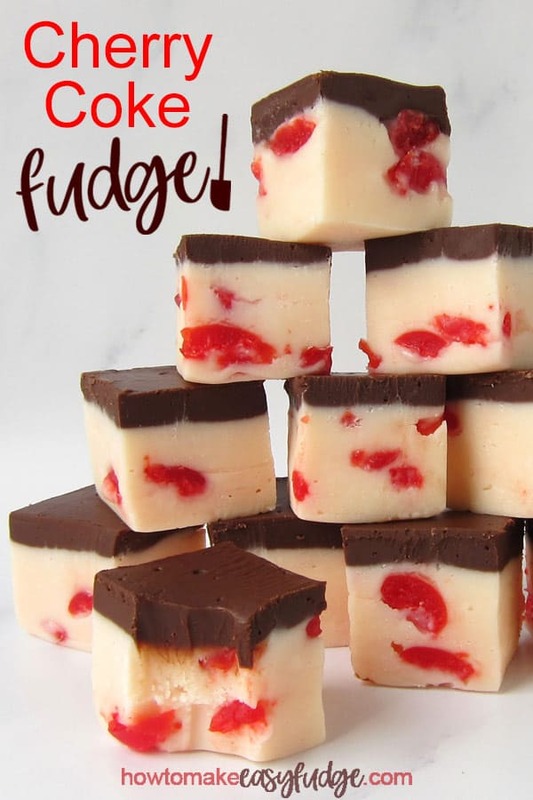 Inspiration for this fudge came from Trish from Mom On Time Out who made her Cherry Coke Fudge by boiling butter, sugar, heavy whipping cream and cherry gelatin. 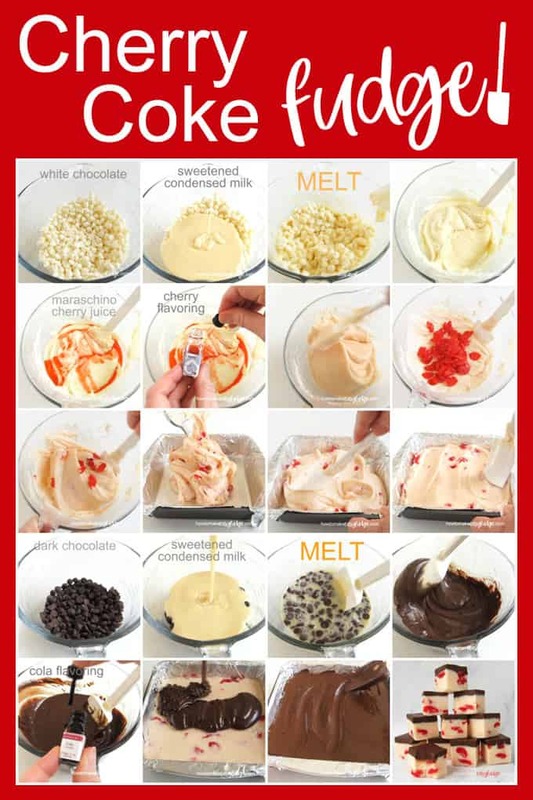 She then stirred in white chocolate, marshmallow fluff, and maraschino cherries and topped that fudge layer with some chocolate frosting flavored with Coca-Cola. I wanted to simplify the Cherry Coke Fudge recipe making is fool-proof and easy to make. 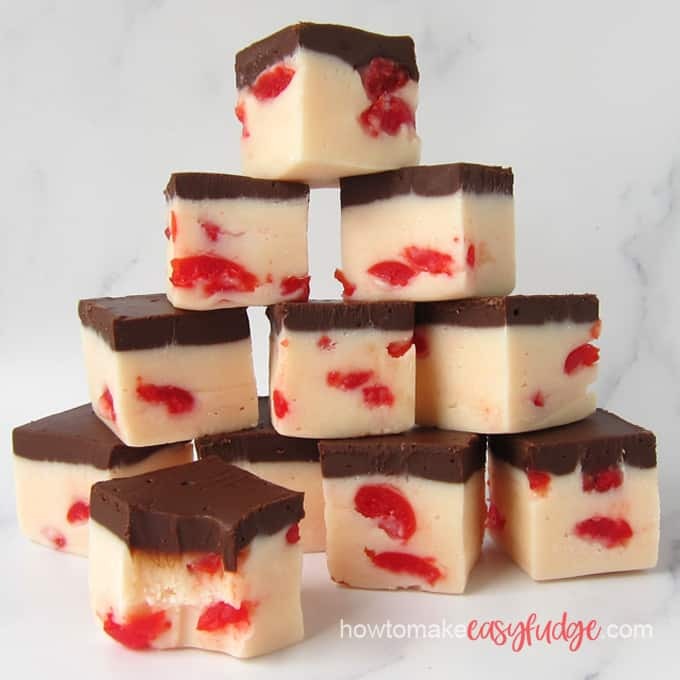 It took a bit of experimenting, boiling down real Cherry Coke, using more maraschino cherry juice, making the fudge all chocolate, and I finally found a fabulous, easy version of the cherry and cola flavored fudge. Start by preparing your 8 inch square pan. My suggestion is to line your pan with non-stick tin foil. See the video below for a fun trick to make this task easy! You can also line the pan with parchment paper strips. Lay one strip across the pan then lay another strip going the opposite way across the pan. Once your fudge has hardened you can use the tin foil or parchment paper to easily lift the fudge out of the pan. If you can’t line the pan you can grease it with butter. Just know that it’s more challenging to get the fudge out of the pan. See all our tips and tricks for preparing your pan, storing fudge, freezing fudge, and more on our Fudge FAQ page. 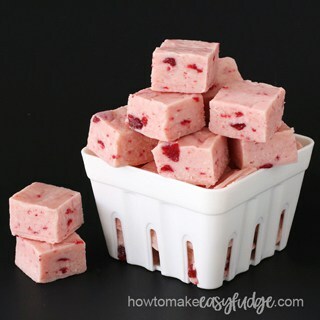 Scoop out 1 tablespoon of maraschino cherry juice which will be used to help flavor your fudge. Remove stems, if needed, and cut 22 maraschino cherries into quarters. Pat the cherries dry, really, really dry! You may need to use quite a few paper towels. If your cherries are too wet your fudge will be wet too! I skipped this step in one of the first batches of fudge I made and it was a huge mess. The juice oozed out of the cherries and made the fudge soupy. Learn from my mistake and really dry those maraschino cherries. Stir together 24-28 ounces of finely chopped white chocolate or white chocolate chips with 1 (14 ounce) can of sweetened condensed milk. Heat in the microwave on 70% power for 1 minute then remove and stir a few times. Heat for an additional 45 seconds at 70% power then allow the bowl to sit in the microwave for 3 minutes. Remove and stir just until the chips start to melt. Pour in one tablespoon of maraschino cherry juice and 6 drops of cherry flavoring and stir to combine. Then stir in the chopped maraschino cherries. NOTES: Do not overheat your white chocolate chips and condensed milk or you may end up with greasy fudge. Heating slowly and allowing the residual heat of the melted chocolate to melt the remaining chips is essential. 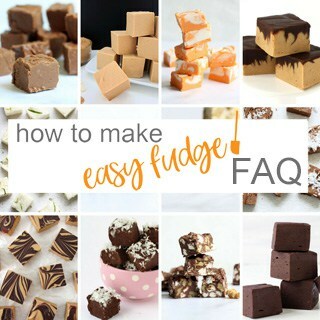 If you do have greasy looking fudge, see our Fudge FAQ page for tips on fixing it. Blend together 8 ounces of semi-sweet chocolate chips or finely chopped semi-sweet chocolate bars with 1 cup of sweetened condensed milk. Heat in the microwave at 70% power for 1 minute 15 seconds then let rest in the microwave for 3 minutes. Remove and stir until the chips melt. Stir in 8 drops of Cola Flavoring. Spread over the cherry fudge layer. Cover and set aside for about 8 hours or refrigerate for about 3 hours until firm. Remove and let sit at room temperature, if needed, for about 30 minutes before cutting. Where can you find Cherry Flavoring and Cola Flavoring? LorAnn Candy Flavoring Oils have really nice flavor and are pretty easy to find. You can order them from amazon. This link allows you to buy 5 different flavored candy oils. You can pick the ones you like. These food approved oils can also be found at cake and candy decorating shops, in discount stores like Walmart (in the baking aisle or cake decorating/craft area) and in grocery stores (either in the baking aisle or in the pharmacy). Can I use real Cherry Coke? Make the cherry layer as listed in the recipe below. Pour a 2 liter bottle of Cherry Coke into a large saucepan or skillet. Continue to boil, stirring often, until the liquid reduces down to about 1/4 cup of thick syrup. This can take over an hour. Remove from the heat and stir in 3/4 cup of sweetened condensed milk and 8 ounces of semi-sweet chocolate chips. Stir until melted and pour over the cherry fudge layer. The flavor of the Cherry Coke will be much more subtle. It has a nice flavor but I honestly don’t think you’d definitely say it tastes like Cherry Coke. What if I leave the cola flavoring out? Without the cola flavoring this fudge tastes almost exactly like a Cordial Cherry. It is amazing! I personally prefer it that way, but then, of course, it isn’t Cherry Coke Fudge it is Cordial Cherry Fudge. 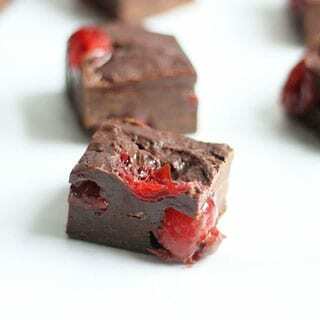 Top a layer of cherry fudge with a layer of chocolate cola fudge to create this delicious Cherry Coke Fudge. 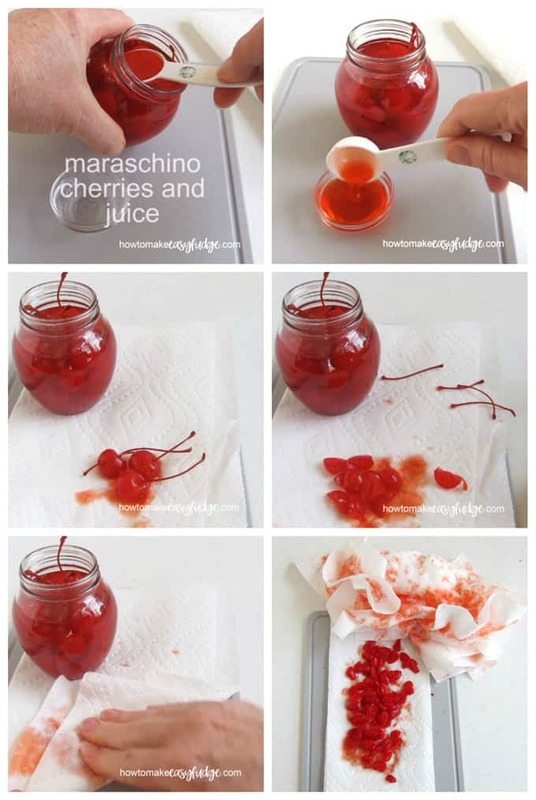 Cut the maraschino cherries into quarters. Pat the cherries really dry using paper towels. Set aside. Combine the white chocolate chips and 1 can of sweetened condensed milk. Heat in the microwave at 70% power for 1 minute then remove and stir. Heat for an additional 45 seconds at 70% power then let the bowl rest in the microwave for 3 minutes. Remove and stir just until the chips begin to melt. Stir in the maraschino cherry juice and cherry flavoring. Add the chopped maraschino cherries. Spread the fudge into a non-stick tin foil or parchment paper lined 8-inch square pan. Stir together the semi-sweet chocolate chips and 1 cup of sweetened condensed milk. Heat at 70% power in the microwave for 1 minute 15 seconds then let the bowl rest in the microwave for 3 minutes. Stir until the chips melt then add 8 drops of cola flavoring. Spread in an even layer over the cherry fudge. Cover and let rest at room temperature for about 8 hours or chill in the refrigerator for about 3 hours until firm. If needed, let the fudge sit at room temperature for about 30 minutes before cutting into 36 squares. 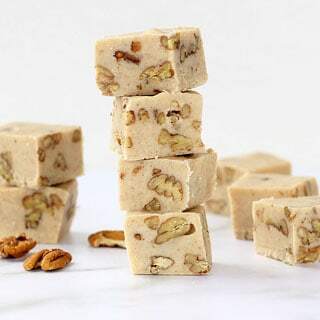 If desired, you can wrap the fudge well in wax paper then over-wrap in tin foil and place in a large zip top bag and freeze for up to 3 months. To thaw, leave the fudge wrapped and set at room temperature for at least one hour, until no longer frozen, before unwrapping. How to store this Cherry Coke fudge? To freeze, wrap fudge in wax paper then over-wrap in tin foil and place in a large zip top bag. Remove all the air from the bag while sealing then freeze for up to 3 months. To thaw frozen fudge, remove the fudge from the freezer and and let it sit in the bag for a few hours until thawed before opening the bag and removing the tin foil and wax paper.